being little • bristol uk fashion & lifestyle blog. : candle light. That's gorgeous! I love cosy little places. In my loft I've made myself a little nest of throws, drapes and sumptuous cushions with books and trinkets all lit up with just fairy lights. It's such escapism up there. I can't explain it but there's something about it that's just magical. I love candles! That makes a nice atmosphere. 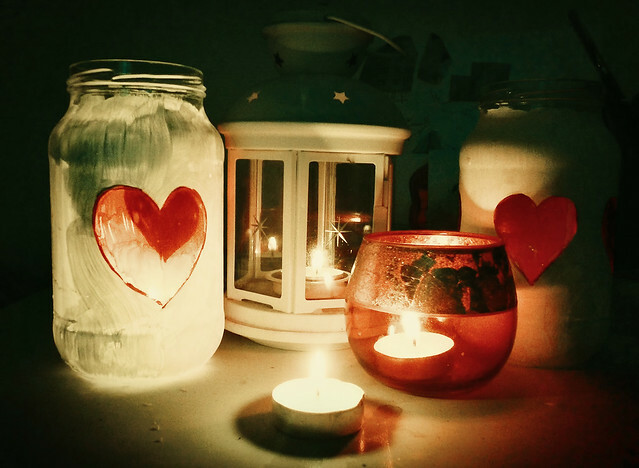 aww there is something lovely about candlelight..we painted coffee jars as candle holders with rangers recently, i should really use candles more, i just always forget to light them..
That picture is gorgeous! I forget how much I love candle light. I use jam jars to put candles in when I have bbqs and parties in the summer and tie ribbon around them. Jam jars are good for mixing cocktails and salad dressings too, very useful!! aww I'd quite like an excuse for an electricity free evening! Sounds lovely. So pretty :) I started burning a Christmas vanilla candle last night, although I'm not sure what was Christmassy about it! All my friends are superheroes is such a great read! I loved it so much I couldn't put it down so I read it in one sitting!